Encino, CA (November 24, 2015) – Superstar country artists played a key role in the success of the record setting 50 th anniversary of the Academy of Country Music Awards held in April. The Awards telecast and ACM Presents: Superstar Duets in May, both on CBS, reached a massive 22.4 MILLION viewers, combined. The ACM Awards delivered its largest viewing audience since 1998 and set a Guinness World Record™ for the most attended live Awards telecast in history, with more than 70,252 in the live audience at AT&T Stadium. On the heels of this unprecedented success, the Academy is announcing a record donation to ACM Lifting Lives in the amount of $1 million, made on behalf of the artists who participated. 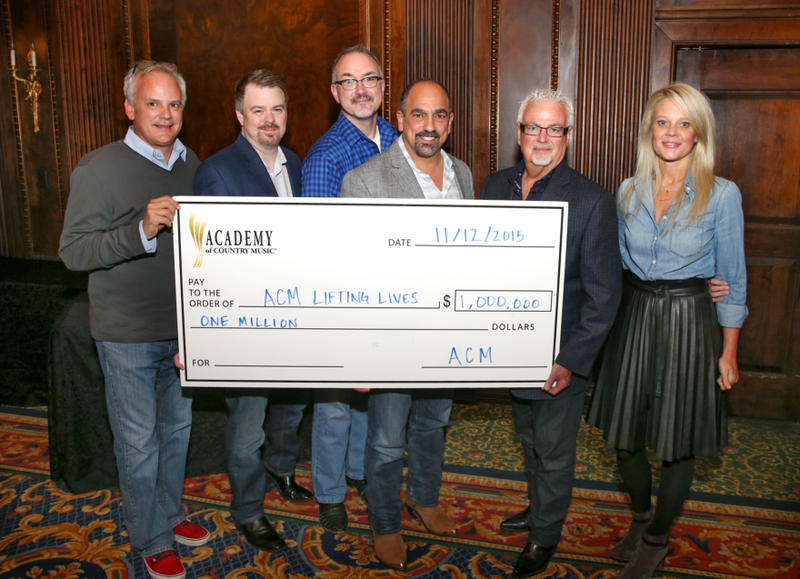 Ticket proceeds from several events in April, including ACM Presents: Superstar Duets, went to ACM Lifting Lives. PHOTO: [Left to right] Academy of Country Music Officers Duane Clark (Treasurer), Ben Vaughn (Vice President), Ken Tucker (President), Paul Barnabee (Chairman), Paul Moore (Parliamentarian) and Tiffany Moon (Secretary). Founded in Southern California in 1964, the ACADEMY OF COUNTRY MUSIC (ACM) is a fan-focused artist and industry-driven organization, providing the financial resources to ensure the on-going philanthropic work of ACM LIFTING LIVES , the charitable arm of the Academy which works to improve lives through the power of music. The Academy has a rich history in the entertainment industry, having been founded when Southern California was a hotbed of emerging country music and when Westerns were a staple of television programing and film production. Comprised of more than 3,800 professional members nationwide, the ACM is headquartered in Encino, Calif. For more information, log onto www.ACMcountry.com or www.ACMLiftingLives.org.